SUBHEAD: Very striking results show radiation injury to whole ecosystems with significant implications for Japan. Image above: A healthy adult pale grass blue butterfly. See image below for mutation. and a mutated variety (bottom) with shriveled wings. 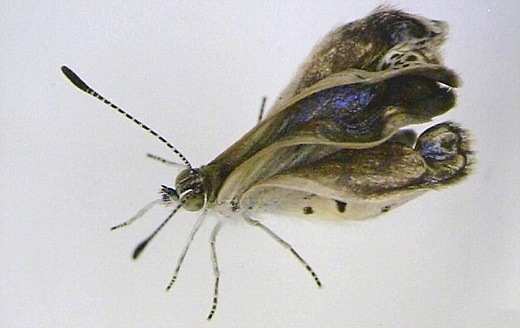 From (http://www.dailymail.co.uk/sciencetech/article-2188017/Radiation-Fukushima-nuclear-power-plant-meltdown-triggers-genetic-mutations-butterflies.html). Dr. Timothy A. Mousseau, Professor of Biological Sciences, University of South Carolina: There’s been some developments in the last year or two — especially in recent months — that really bring some sense of urgency to sharing some of these latest findings… Hopefully this will be of some relevance to the people of Japan, as well as people that might be visiting Japan in the coming years. My concerns of the past few months stems from the fact that there’s a growing number of scientific studies concerning radiation effects on plants and animals from Chernobyl, but also from Fukushima. These have clearly demonstrated impacts — injuries — to individuals, populations, communities, and even whole ecosystems. These findings have significant implications for the recovery of contaminated regions of Japan. Mousseau: These next figures are really, really important, and this really was the motivation for speaking today. These are the results from 4 years of data, so starting July 2011, and we just did the last count last month here in Fukushima. This graph shows very, very strikingly the total numbers of birds drops off with radiation in Fukushima in a very consistent pattern. There’s no evidence of any kind of threshold of radiation level below which there’s no effect — very consistent from over the years, with the effect increasing though time. The effects on species richness or biodiversity are even more striking, dropping off with increasing radiation… Very, very striking patterns of results… So what does this all mean? I would suggest that what it means is that, contrary to governmental reports, there’s now an abundance of information demonstrating consequences — in other words, injury — to individuals, populations, species, and ecosystem functions, stemming from the low dose radiation due to Chernobyl and Fukushima disasters. 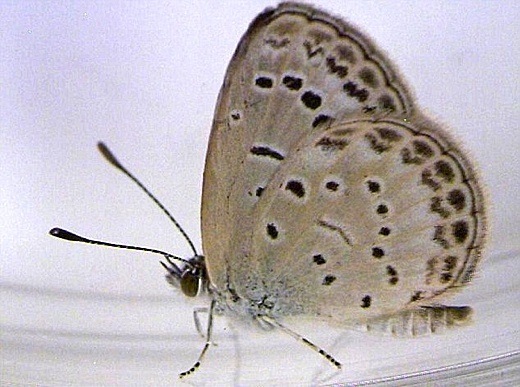 Image above: A adult pale grass blue butterfly exhibiting signs of mutations due to radiation in Fukushima, Japan. See image below for mutation. and a mutated variety (bottom) with shriveled wings. From (http://www.dailymail.co.uk/sciencetech/article-2188017/Radiation-Fukushima-nuclear-power-plant-meltdown-triggers-genetic-mutations-butterflies.html). Mousseau: The point today is that as far as we can tell so far, there does not seem to be any dramatic difference between the effects of radiation in Chernobyl versus the effects of radiation in Fukushima. I think that is one of the take home messages. Elaine Kurtenbach, AP reporter: I’m assuming this has ecosystem wide impacts… Are you extrapolating… that perhaps part of the reason why the number of animals is decreasing is because the entire ecosystem is affected by the radiation?Mousseau: …To the issue of global ecosystem effects, yes, I think the only conclusion you can come to from the increasing body of evidence of Chernobyl is that all components of this ecosystem seem to be affected, from the bacteria in the soil, the fungi in the soil, all the way up to the top predators… they are all connected of course. As we pick away at the various components of the ecosystem, we have not found any particular components that don’t seem to be affected in some way. Video above: Prof. Timothy Mousseau's presentation at Foreign Correspondents Club of Japan. From (http://youtu.be/8IcTGUMwVtU).